This deeply indented fluted point was restored from two fragments unearthed during archaeological excavations conducted by the Buffalo Museum of Science in 1986. It is fashioned of semi- translucent gray honey-colored Vanport chert or chalcedony, presumed to be derived from outcrops at Flint Ridge, Licking County, Ohio. The point may have been longer when freshly made but later resharpened. This point is identical in basal shape and length of its channel flake scars to specimens from the Vail Paleo-Indian site, Oxford County, Maine. Lamb-74/87 belongs to an assemblage of 23 fluted projectile points and knives, a fluted drill and point preforms that were discovered at the Lamb site. This extraordinary group of artifacts were made of raw materials exotic to western New York and may represent a hunter's toolkit, which accompanied its owner to the grave. 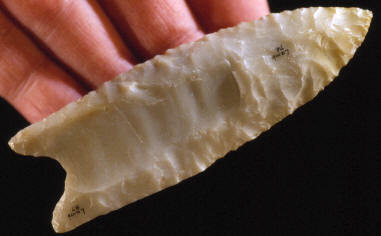 This fluted point is one of the best examples that was found on the Lamb site. It was found broken as were all the other fluted points on this site but this one was not missing any pieces. These five points represent some of the best most complete examples found on this Lamb site. All of the points found on this site were broken and have restoration to repair missing pieces except for the example at the top of the page. The point at the top is made of Flint Ridge chert from Ohio. The point to the left is made of Upper Mercer chert from Ohio. 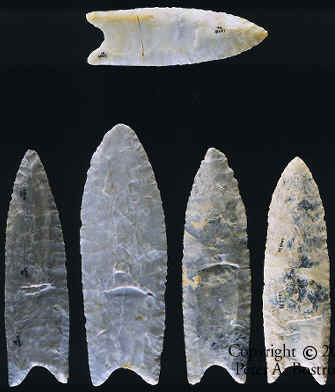 The point to the right was believed to be made of Knife River chert from North Dakota but may also be made of Cattail Creek chert from the eastern U.S. around Virginia.